The SkyTrain Lobby – Just The Usual Suspects! "It used to be something called public transit ... then for reasons you're too young to understand, they did away with the public." Transit again is making front page news in the dailies and regional newspapers, with TransLink claiming that the next big rapid transit (read SkyTrain) line will be in Surrey, not Broadway. A few international transit blogs have picked up the story with the usual suspects singing hosannas about SkyTrain, while in the same breathe libeling anyone who supports light rail, including long time advocates of the worlds most built transit system! What is perverse about the SkyTrain lobby is that they moan on and on about how facts about LRT being distorted or untrue, yet all they have to offer in turn is TransLink’s dubious claims about SkyTrain and the Canada Line, which is a conventional metro and not ART. What is even more sad is that the old saw, “SkyTrain is cheaper to operate than light rail because it has no drivers” is trundled out ad naseum by the usual suspects and by bloggists who should know better. Automatic or driverless railways were the flavour of the month back in the 70’s and 80’s but have been found expensive to operate. Sure the system has no drivers, but in their stead an automatic metro system must hire a small army of attendants to keep trains and stations safe for the paying public. Not mentioned too, is a rather large squad of signaling experts must be on shift at all times to deal with problems with train operation because with an automatic metro, operating conditions must be at 100% or the system grinds to a halt. What has been found is that automatic metros are only cost effective if average hourly ridership is above about 15,000 persons per hour per direction, below that threshold, LRT is cheaper to operate and at 15,000 to 20,000 pphpd operating costs of both modes are about the same. Yet, one never hears this from the usual suspects. 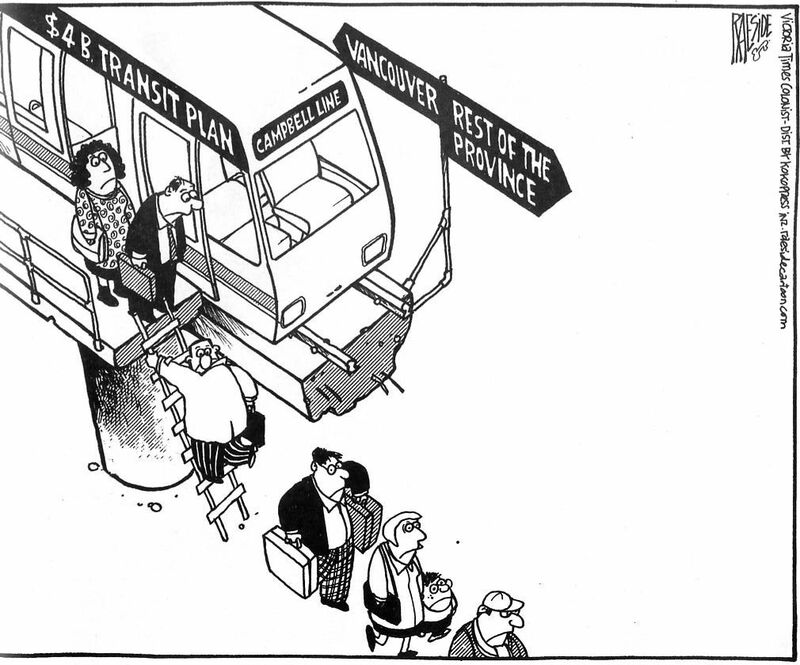 We have had now thirty years of SkyTrain only planning in the region and it has left us with a massive transit deficit. Sure, the SkyTrain metro system carries a lot of passengers, but 80% of those passengers have been forced to transfer from bus to metro. Transfers, especially forced transfers not only increase travel time, it deters about 70%of potential customers. There is no evidence that the SkyTrain metro system has caused a modal shift from car to transit and with the multi-billion Gateway highways and bridge project shows that the SkyTrain system is actually fueling new highway construction! SkyTrain is too expensive to extend and even finding funds to complete the Evergreen Line (Nevergreen Line) are almost impossible to come by, yet the SkyTrain Lobby persists that the proprietary metro is just ‘peachy‘. To date, SkyTrain has yet to prove in revenue service that it is cheaper to operate than light rail; to date SkyTrain has yet to prove in revenue service that it can carry more passengers than light rail! These two facts accounts for ICTS/ALRT/ALM/ART dismal sales record when compared to light rail and the once mighty Skytrain has now been relegated as a niche transit system for airports and theme parks. The usual suspects again remain silent about this. Requiring fully grade separated R-O-W and stations and higher car and equipment costs, total construction costs is higher for AGT than LRT. A city selecting AGT will tend to have a smaller rapid transit network than a city selecting LRT. There is no evidence that automatic operation saves operating and maintenance costs compared to modern LRT operating on a comparable quality of alignment. The rigidity imposed on operations by a centralized control system and lack of localized response options have resulted in poor levels of reliability on AGT compared to the more versatile LRT systems. LRT and AGT have similar capacities capabilities if used on the same quality of alignment. LRT also has the option to branch out on less costly R-O-W. Being a product of contemporary technology, AGT systems carry with them the seeds of obsolescence. Transit agencies that buy into proprietary systems should consider their future procurement options, particularly if the original equipment manufacturer were to cease operations. The SkyTrain Lobby, with the usual suspects, ignore transit studies from experts who have hands on knowledge about light rail and metro and continue to put evangelic faith with those who want ‘pie in the sky’ metro and subway planning. The taxpayer, especially taxpayers who live South of the Fraser are growing weary of paying higher taxes to build just a little more politically prestigious metro in Greater Vancouver, just ask Premier Gordon Campbell and the HST fiasco. “Build it Cheap and Build Lots“. Surrey mayor, Dianne Watts, clearly understands the costs of ‘rail’ transit (the term ‘rapid transit’ is used by lazy or uniformed people) and that to get a larger more workable ‘rail‘ network for her city, she must opt for modern light rail. While Vancouver pines for another multi-billion dollar subway under Broadway, its politicians seem oblivious to the massive financial obligations needed to fund metro/subway. For the past three decades, Vancouver was happy to let others fund their metro system, but today’s financial realities means that there will be no more metro construction in the foreseeable future. The math is simple; for every km. of SkyTrain built, one can build up to 10 km. of light rail! The problem with Metro (today’s GVRD) and TransLink, their top planners have never understood ‘rail’ transit and plan for prestigious metro and subways such as SkyTrain and treat modern light rail as a poorman’s SkyTrain. 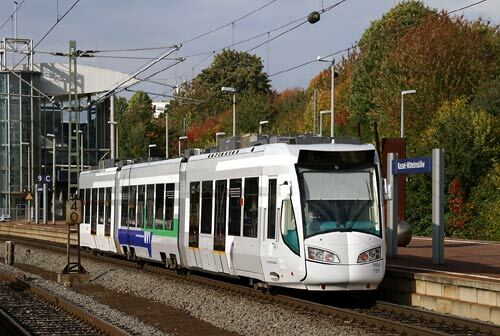 Being at-grade doesn’t mean light rail can’t be fast nor does it condemn LRT as being slow, as any transit system is as fast as it is designers have designed it to be. What is so sad, is when one hears the term ‘greenhouse objectives and regional transit planning in the same sentence. Despite over $8 billion spent on three light-metro lines, there has been no discernible modal shift from car to metro! In fact. subways are poor in attracting new ridership. I would not call SkyTrain a ‘Cadillac’ transit system, rather it is an ‘Edsel’ transit system, that no one in Europe and North America want to build. In short, SkyTrain is an operating museum piece, which showcases 1970’s ‘rail’ transit philosophy. Today its 2010 and the financial realities of future fragile economy in the coming decade mean gold plated light-metro lines like SkyTrain will be seen as political follies. 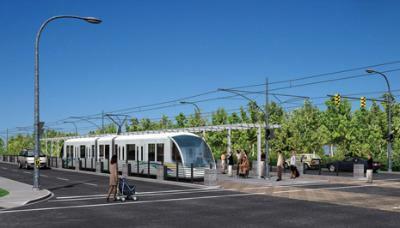 In a few weeks, Rail for the Valley will also join the fray with its plans, which will bolster Mayor Watts demands for light rail. With two competing transit modes, the Metro region will live with a dichotomy of light-metro operation North of the Fraser River and light rail South of the Fraser and soon calls will be made by those who have SkyTrain, be made to pay the higher costs for building and operating light metro. If North Fraser taxpayers (SkyTrain zone) are not inclined to do so, it may fuel the many calls for succession of South of the Fraser municipalities from TransLink. If TransLink splits, it will force North of the Fraser taxpayers into a new economic reality, one that their politicians turned a blind eye to, in their haste to build politically prestigious light metro, letting the rest of the regions taxpayers to fund it. When rapid transit expands south of the Fraser River, Surrey Mayor Dianne Watts wants it to be at-grade and light rail — not overhead or underground or as expensive as SkyTrain. But whatever happens with rapid transit, she doesn’t want to get into a battle with Vancouver over which area gets the next expansion. “You’ve got to go where the need is,” said Watts Monday, reacting to a Metro Vancouver report that put expansion to the University of B.C. low on the priority list. It’s difficult to argue with the need for transit south of the Fraser River. The draft regional-growth strategy report titled Metro Vancouver 2040, which was released last week, identified the top rapid-transit expansion priority as the $1.4-billion Evergreen Line connecting Coquitlam Regional City Centre to Lougheed Municipal Town Centre. But the second priority was rapid-transit expansion from Surrey Metro Centre to one or more of the south of Fraser regional town centres — along with connecting Central Broadway in Vancouver to the existing rapid-transit network. Presumably, that connection would be an extension of the Millennium Line as far as Arbutus. A UBC expansion was well down on the list of other needs. Vancouver councillor Geoff Meggs, the city’s point man on transportation, thinks a connection to UBC is “inevitable” but knows Central Broadway is a more pressing priority. “To meet the greenhouse-gas objectives the province has set, and to ensure economic health, we should try to find the funding to do these all as fast as possible,” said Meggs. But TransLink still doesn’t have its $400-million share of the Evergreen project, which is supposed to start construction in 2011 and be complete by 2014. The following are two studies that have been done concerning ‘rail’ transit in the Fraser Valley. I find it very strange that The municipality of Chilliwack is not involved with the South of Fraser Community Rail Task Force and many local residents would like to know the reason why? Certainly having a direct rail connection to Vancouver would be a bonus for both local businesses, especially tourist oriented businesses and for local residents, with reliable and timely communication with Abbotsford, Langley, Surrey and Vancouver. Being involved with the South of Fraser Community Rail Task Force would dispel the many myths about ‘rail’ transit and TramTrain, especially the assertion of mayor Gaetz, that trains can’t travel faster than 10 kph on the former BCE route. 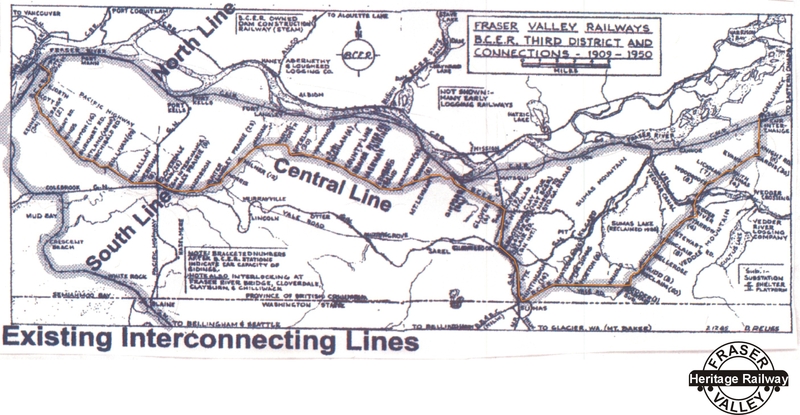 Not so, as Rail for The Valley envisions a 90 kph service along the line, not unlike the express interurban trains that once raced along the route for 50 years. 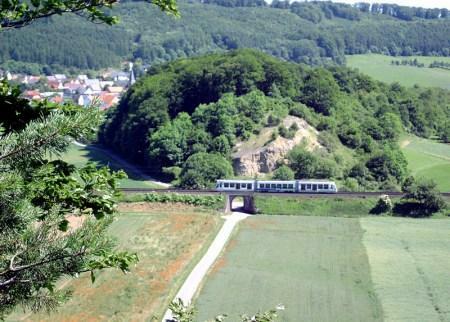 The geometry of the track was designed for short wheelbase interurbans (not unlike modern TramTrain) not today’s heavy freight trains, with freight cars up to 25 metres in length on less than adequately maintained track. It is time for Chilliwack politicians to get involved, as their indifference could be inferred that they don’t care for 21st century public transportation and could mean that the Valley interurban would only go as far as Langley or Abbotsford. Such short sightedness, especially in an age of high fuel prices, global warming, traffic congestion, and pollution, the City of Chilliwack Council could very ‘miss the train’. Chilliwack is the only municipality in the Lower Mainland not on board a task force lobbying for a community rail system. “For the last three years, Rail For The Valley has been pressing the issue of a passenger rail service that would run from Chilliwack to Surrey,” said RFTV spokesman Paul Gieselman. “Much progress has been made … however, this has not been a unified movement,” he said. The South of Fraser Community Rail Task Force includes representatives from Delta, Langley and Abbotsford – but not Chilliwack. “Chilliwack has been invited, but has not decided to get on board,” Gieselman said. An open house is being held in Chilliwack July 8 to inform the public about the work of the task force, and “put pressure on the city” to join, he said. Chilliwack Mayor Sharon Gaetz has balked at committing the city to passenger rail until a transportation study by the provincial government is completed. She is also concerned about the potential cost of restoring the old Inter-Urban rail line that once ran from Chilliwack to New Westminster. Just upgrading the 17 or 18 rail crossings could cost $500,000 each, according to an estimate by city staff. But Gieselman said the mayor is getting hung up on the costs instead of the potential benefits. The Chilliwack open house starts at 5 p.m. at Evergreen Hall on Corbould Street.